My salad bowl is quickly coming to a halt as the temperatures have been climbing upwards steadily since mid May. 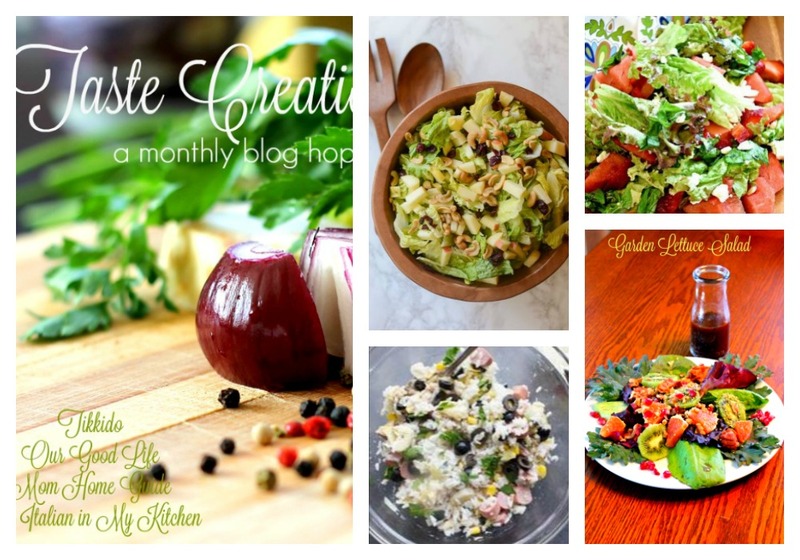 Just in time to share with you one of my favorite creations for our Taste Creations Salad Month! Growing your own lettuce is a breeze, especially if you use a large flower pot! The rabbits and deer don't seem to notice the yummy goods in the flower pot and I always get a fantastic crop! I tend to overplant but that helps keep the soil moist when the sun is bright and shining. Wash lettuce leaves and pat dry. Arrange on a plate as the base. Add all other toppings sprinkled over the leaves of lettuce. Serve with homemade balsamic vinaigrette. 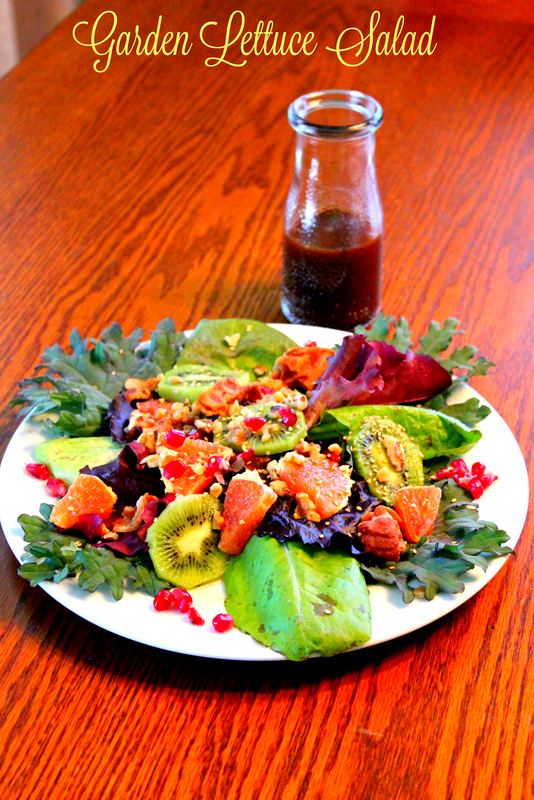 When you see how easy this is to make, you'll never want to buy store bought dressings again! Pour olive oil in a bowl. Drizzle in vinegar and whisk until fully incorporated. Add in other ingredients and whisk to mix. Keeps up to two weeks in a refrigerator. Please visit our other hostesses for fantastic salads and dressings, too! You can follow them on social media and your inbox will love you! An Italian in My Kitchen Mediterranean Summer Vegetable Rice Salad. Next month we will be featuring all dishes TOMATO! Cannot wait to see what our group comes up with to share with you. Oh this is beautiful, I could eat my screen LOL! Balsamic Vinaigrette is my favorite; definitely going to try your recipe. I prefer to make it over buying store brand. Bacon and fruit? That seems very interesting. I will have to give this a try! I love salads! They are definitely one of my go to lunches or even dinners when the weather gets warmer. Homemade dressings are pretty hard to beat. I definitely agree with you there and this one looks amazing. what a delicious looking salad. I lvoe sandal at summer time. That looks so amazing. I love to eat salads, especially in the summer. I just love homemade dressing! It's almost impossible to enjoy store bought after spoiling yourself with making it at home! Oooh, yay! I never think to make homemade dressing. I will definitely try this! What a scrumptious looking salad. Love homemade dressings too. Will try it. Your salad looks divine! That looks so refreshing and perfect for Summer. I love a good salad for lunch, it seems like the perfect mid-day meal. These are some delicious salads! Something different to try! I love salad! I eat a salad just about every day. My lettuce so far is being ignored by the woodchuck. Hopefully that will continue until I get the garden fence up! I love balsamic vinegarette on my salads. Salad is the perfect meal or snack for this time of year when the weather gets warmer! I should use a flower pot! I had never thought it! The deer around here are crazy so I never plant lettuce. I love me some salads, and this one looks so yummy and different. Thanks for posting, I shall try it out. I grow my own lettuce and spinach too! This looks like a good salad too, plus the fresh greens make it better! This looks so good! 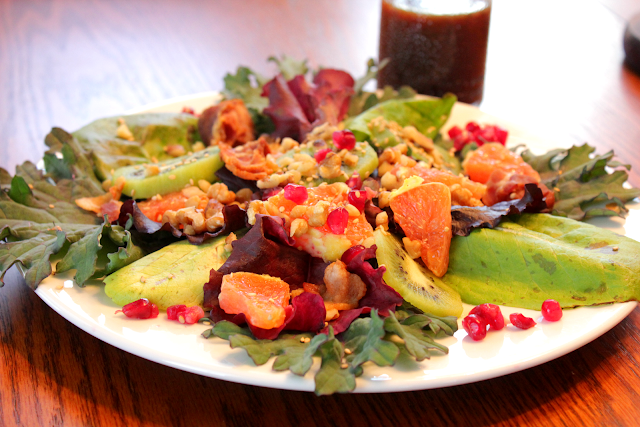 I love the way adding fruit to salads elevates them. There is no question that enjoying these salads is so much better when you make them with fresh ingredients. They are perfect for enjoying during lunch at work when it's warm outside. Your salad looks amazing. I love adding a little bit of fruit to mine, too. I always make my own dressings, as well. That's a beautiful salad! I love trying out different kinds of salad, but never tried anything like this before. Thanks for sharing the recipe! This looks so incredibly tasty! That dressing recipe has my name written all over it. My salads are usually boring, but you're inspiring me to want to spruce it up a bit. Any time you pair fruits, nuts and salad ... it's a winner in my book. Yummy! Sounds amazing Terri, can't wait to try it. Love being part of the Blog hop with you. I love salads! This one looks so delicious and your recipe is so easy to follow! I love growing my own lettuce. So delicious! The salad looks amazing. I will skip the bacon, but double the pomegranates (we are huge fans). Can't wait to see what your group is going to come up with for July. Tomatoes are my obsession. I eat a couple of heirloom tomatoes EVERY single day! Looks delicious. I eat salads daily during this time of year. It's the best time for seasonal produce. Great presentation! I never used to put fruits in my salads until about 2 years ago and now I can't stop! So good! Tried a strawberry vinaigrette yesterday that was divine! My husband always tells me that salad is my specialty! 🙈 I think that's code for I can't cook very well! I love homemade balsamic! I can't even eat store bought anymore! This looks so yummy! This looks amazing! My hubby is a farmer, so this is right up our alley. I love that you added various fruits too. I've never tried a salad with pomegranate. I'm definitely trying this when his garden sprouts! I really fancy salads and it truly is an art to making a good salad. Their creations are very much appreciated. I go twice a week to my favorite salad place- sweet greens. They have wonderful mixes. The thing I love about salads is that you can just do your own thing, mix and match and just experiment! Thanks for sharing your creation! Salads and summer go together like PB&J. I love a good summer salad..